It might be very rare to find an Internet user who doesn't use online messenger services like Google Hangouts, Yahoo Messenger, WhatsApp etc. These tools help us to maintain our relationships even in our busy lifestyle. These Internet Messengers are safe and useful as long as you limit your friendship with known people. However, it is not possible always. So what can we do to make sure the online chat contacts are not lying? The first step is to make sure they are telling the exact location from where they are chatting. How can we find the location of a messenger friend? It is possible but not very simple because chat tools like Yahoo Messenger or WhatsApp are providing the IP address (layer 3 address) of the server, not the individual chat contacts. However, we can find the layer 3 address of a chat contact if we try hard. This tutorial gives an outline to trace the actual location of a messenger contact. The step by step instructions provided below will help you to reveal the actual physical location of your online friend. To find the IP address of your chat friend, create a TCP/IP connection between your computer and his computer. Actually, you can start this connection very simply. Invite him to share a file in the middle of chatting with him. If he accepts the file sharing and starts sharing files, automatically a TCP/IP connection starts. This makes your computers in a peer to peer mode irrespective of the chat tools you use. You can try the same step for Yahoo Messenger, Gtalk, and WhatsApp. 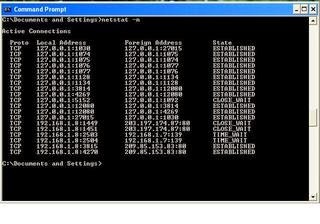 Open command prompt and type netstat -n command and press enter. Now the list of addresses to which your computer has active TCP/IP connections will appear. It is important to note that while you process the netstat command, there must be an active connection between your computer and his computer. If there is no such connection at that time, you will get only the Yahoo chat server address instead of his IP address. We have found the IP address of the online messenger contact now we must find the physical location using that information. You can use the following online free services to find the physical location using the logical address information.